But why is it mayhem part 2, you might ask? Well, Faith technically has hot lunch days on Wednesday, but she didn't order it. I let her pick and she only wanted the Chik Fil A day and the pizza day. So she needs a lunch too. As noted in the prior post, the boy commandeered the last muffin, which meant I was without a go-to staple (stuffed muffins of some sort, not just corndog). However, I do have other leftovers and being that I teach at Faith's school, *I* have access to a microwave. She goes to lunch as my kids are finishing recess and having our morning restroom break, so I can easily nuke something for 30 seconds at that time. 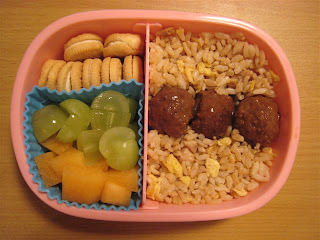 Faith has leftover fried rice, leftover sweet & sour meatballs, mini vanilla Oreos and canteloupe & grapes. It's packed so I can easily move the fruit/cookies out, pop it in the microwave and put the fruit/cookies back in. Not bad for minimal notice and a lack of basic foods!